The first full-size solar/electric pumpout boat has been launched in Connecticut with the goal of bringing more efficiency to pumpout boat service and turning an environmentally sound service into a full green operation. The vessel was built by Pilot’s Point Marina, a Safe Harbor Marinas property, in Westbrook, Connecticut, for the Town of Branford and East Shore District Health Department (ESDHD). The boat will be used for the Shoreline Regional Pump-Out Boat Program. Under the existing program boaters on the waters of Branford, East Haven, Guilford, New Haven and West Haven can call to have a pumpout boat come to them to remove the sewage from their holding tanks free of charge. The pumpout service operates Thursday through Monday, from May through October. Last season, the boats collected more than 200,000 gallons of sewage. The construction of this new solar vessel will enable boaters on the Branford River and Branford Harbor to also take advantage of the service. The vessel is docked at Bruce and Johnson’s Marina, another Safe Harbor facility. Connecticut previously launched three smaller solar powered vessels that were built by Pilots Point Marina and designed for use in the marina basin. The boats are 11-foot stand-up console workboats with the solar panels mounted on the deck and electric Raymarine engines. “They were incredibly successful and customers loved them. 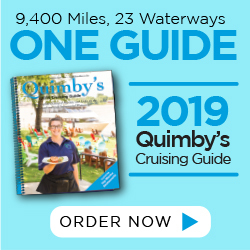 The small boats can fit between two larger boats in a slip and easily do a pumpout, while barely making a sound,” said Kate Brown, BIG/CVA program coordinator, Navigation and Boating Infrastructure Unit at the Connecticut Department of Energy and Environmental Protection (DEEP). While the small boat worked well for marinas, a larger version was needed to enable travel through the bigger and busier rivers and harbors. The new vessel, designed by Pedrick Yacht Designs in Newport, Rhode Island, is 25 feet in length, with a 400-gallon holding tank. A T-top houses the solar panels. The batteries that store the energy were built by Torqeedo in Germany and are stored below deck. The boat runs on twin 40 hp. Torqeedo motors, which can be plugged in once at the dock if the solar energy runs low. Sea trials were conducted with the boat running easily at 6.5 knots on just half power, and at the end of a 4-hour ride on the river, the batteries still had a 50 percent charge. The advantages of solar over combustion engines really comes into play with pumpout boats because the boats are so often at idle while they are pumping out another boat. Electric engines are more efficient for idling, reducing the overall wear and tear of the engines and need for replacements. All the pumpout boats have been funded through the U.S. Fish and Wildlife Service’s Clean Vessel Act pumpout grant program that funds pumpout equipment, installation and maintenance at a 75 percent to 25 percent match. DEEP helped coordinate the grant application and funding for the project. “The state, regional and national USFWS representatives were very supportive of solar boats and didn’t hesitate to fund what was a new concept under the grant program,” Brown said. The final cost was approximately $200,000. ESDHD conducted fundraising for much of the match, holding golf tournaments, starting a GoFundMe campaign, and holding a competition for elementary students to name the new boat. “Not only does this help involve the kids in their community but gives them a chance to learn about environmental protection,” Brown said. The government support partly came from looking at the findings from a Yale University study that looked at the cost effectiveness of going from an internal combustion engine to solar power. The students from the schools Department of Public Health worked with the Town of Branford, DEEP and USFWS to determine if using solar boats on a national program basis would be cost-effective and provide long-term benefits. They conducted a national survey of Clean Vessel Act managers and pumpout operators to gauge interest in solar with findings that there was significant interest, particularly from coastal programs. The study further found that while the upfront cost of the batteries and motors was more for solar, the maintenance and downtime for the vessel were much less. Also, as technology improves, the report said, the cost of construction for the solar boats will come down. All the solar boats are aluminum. It took about three years for the design and accompanying legal and insurance requirements to be completed, plus acquiring the funding. Actual construction took just three months. The length of time is expected to decrease further now that the initial hurdles have been crossed. Brown emphasized that if the boats become more popular it will be easier and cheaper to have them made from fiberglass, but it would only be cost-effective to construct the fiberglass molds if the boats were to be built on a more regular basis. “All pumpout operators in Connecticut are aware of the boat. Once it operates for a season, it will very likely generate more interest. But it would have to be suited to the area. Solar wouldn’t work well in New Long Harbor or going out to Fisher Island. The boat right now doesn’t have enough torque to handle those areas given the subs and ferries. The boat can’t get up on a plane in those rougher waters. But in areas like the river, bays and lakes, calmer seas, it could have a lot of utility for the state,” Brown said. 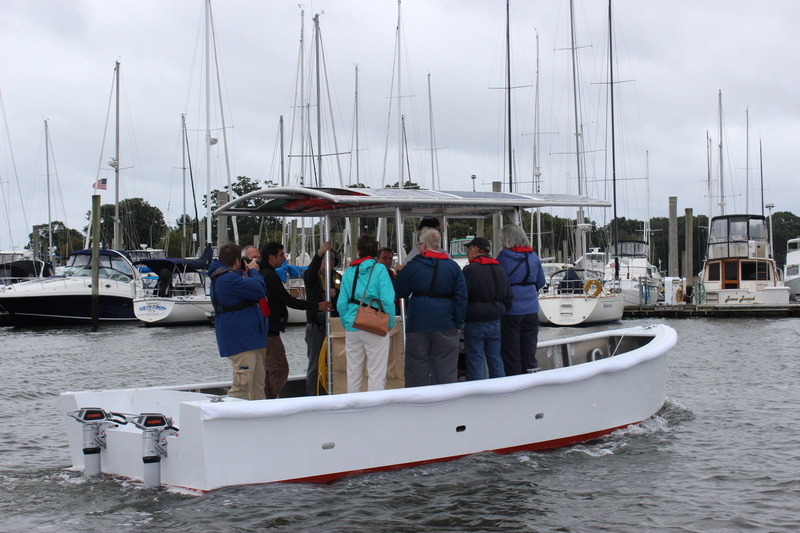 The boat was also presented at this year’s States Organization for Boating Access conference and gained much interest from the state CVA coordinators. In addition, boat manufacturers have been in touch with Brown and Maxwell to get more information on design. Brown pointed out that building the boat and running it created four clean energy jobs. “I hope the trend kicks in so we’re not only reducing waste in the water but also reducing our carbon footprint at the same time,” Brown said.